Here’s the thing about regular sugar cookies: the process is fun, the result is mediocre at best. The only reason anyone even eats traditional sugar cookies is because of the icing; get served an un-iced sugar cookie and you’ll easily go into grinch mode. Now granted there are good sugar cookie recipes out there, but let’s be honest, even the excellent ones lack a certain flair. But you still want to process of making them. The rolling, the cutting, the icing. Zimtsterne to the rescue. 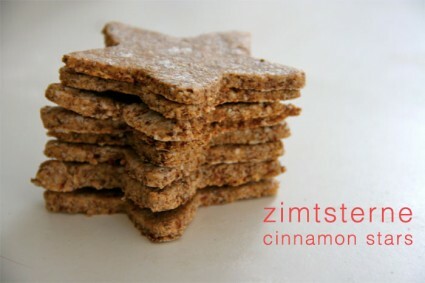 The classic German holiday cookie is not only a more adventurous cookie – did someone say cinnamon? – but they are also gluten free. In full disclosure, the first time the Foodie Underground team tested these out, we forgot to add in the sugar in the dough. This was of course a delightful discovery, because since you roll the dough out in powdered sugar instead of flour, you get enough sweetness even if you don’t add in a sweetener from the get go. This will make anyone that is trying to cut down on sugar quite happy. That being said, we included a little sugar in this recipe, just to satiate your holiday sugar craving. Note that these cookies are just as good with or without icing, and traditionally they’re made with a meringue glaze. The easier route is to do a basic powdered sugar and water icing (start with powdered sugar, and add just a tiny bit of water until you have a glaze consistency), but if you’re going to go the full foodie mode switch out the water for orange juice and and add a little orange zest. 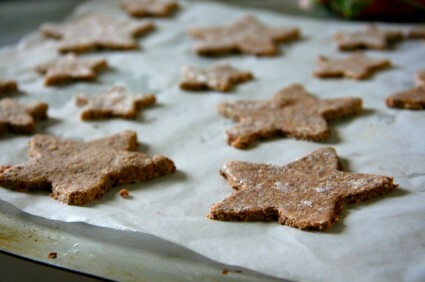 You’ll end up with a little more flavor and a hint of color without ever getting near a bottle of food coloring, satisfying all of your sugar cookie baking desires and resulting in a much more interesting batch of goodies that you can package up and hand off to friends and family as presents. Just don’t wrap them in twine please. Beat egg whites until they form stiff peaks. Fold in (carefully!) powdered sugar with about ten folds. In a separate bowl, mix cinnamon, almond extract, and vanilla sugar. Fold into egg mixture. Fold in ground almonds half a cup at a time until dough is formed. You don’t want the consistency to be too sticky since you will be rolling these out. Use powdered sugar to dust a flat surface and roll out the dough with a rolling pin (wine bottles work too!). 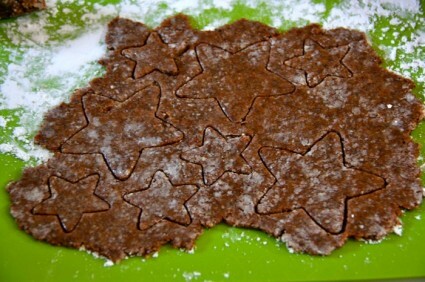 Cut out stars with a cookie cutter and place on a greased baking sheet, or on parchment paper. Bake at 275F for about 25 minutes. Remove from oven and let cool before icing. Or dust with powdered sugar. Or serve as is. Send us your favorite holiday guilty snack pleasure – we love green bean casserole too, don’t worry – and we’ll pick one to revamp, foodie style. The winning dish will win a $70 gift certificate from our good friends at Horny Toad and a handmade Laura Cooke Ceramics coffee mug (with an animal print of your choice). Email your suggestions to info[at]foodieunderground[dot]com or use#foodieholidaze on Twitter.